I wrote eight weeks ago, just before UCL’s first foray on FutureLearn went live, to share thoughts on the journey so far. 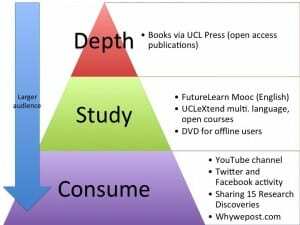 By way of transparency, and [selfishly] having a justification to look back, I wanted to share some reflections after UCL’s first, and second, Moocs have finished. There’s a lot to get through and I hope that the effort spent on these outputs will be enjoyed by many as the months and years go by. Thanks to Zeemaps, who provide this service for free. It started with a very Brazilian focus due to some early publicity from a blogger in South America but then as the course started, the pins started appearing all over. 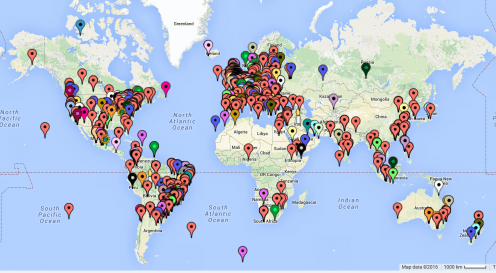 It’s so exciting to see all these people, from all across the world, taking part in a simple exercise as ‘pin yourself on the map’. It should become a standard feature for all online courses, especially very international ones. Some people even put full names and addresses – if I had the budget – I’d like to send them all a postcard from Bloomsbury, London! 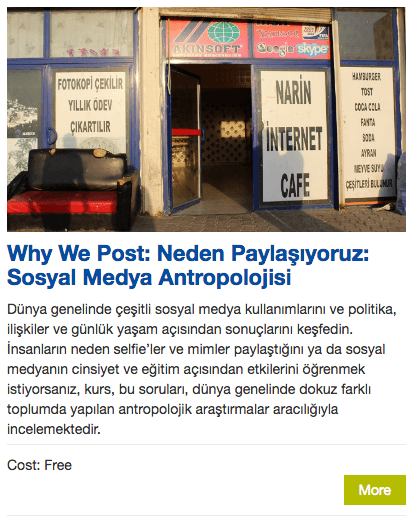 Each team member in Why We Post, or the original ‘Social Media Impact Study’ research activity, was given a fieldsite where they will spend many months studying the use of social media, and the surrounding anthropological context. 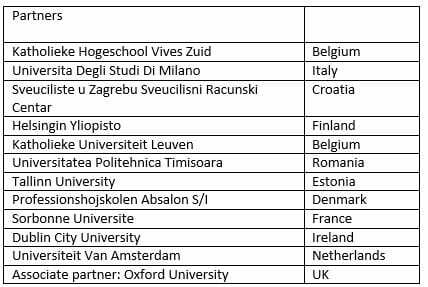 There was always the ambition to make the research outputs as multilingual as possible – so we ended up with the brief of making 9 courses as a part of the dissemination package. Making one online course is challenging enough but 9, in 7 languages you don’t know, is an interesting challenge. Firstly the plan was to build the course in FutureLearn – this would prove enough lessons-learned to equip us (disclaimer: Laura Haapio-Kirk far more than me) with a working model of the course. Once built (or mostly so) we then made a pathway of converting it into UCLeXtend – still English. Now FutureLearn and Moodle are different beasts – but we found ways through. With a little tinkering, and designing a style-guide, we converted one platform to the other (by hand, btw, and all credit to Perla Rembiszewski who worked super hard to get this done). Once the English UCLeXtend course was ready it became a template, Perla and Laura then converted it into 7 documents, all in English but with empty placeholders for the translation. If you imagine breaking a course down into chunks – each of these would be a row in a table. Then it gets tricky, translation is not a process, it’s an art. 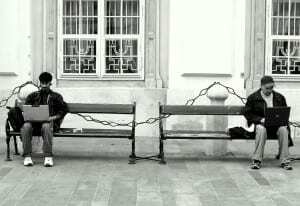 A translator is not an Input:Output engine, they’re a multilingual human. They have to read, interpret, learn, translate and then piece it back together. Being super organised helps a lot. The process creates mistakes and translation quality is, at best a variable, and at worst, somewhat arguable. Unless you’re paying full whack (which gets super-expensive) you’re also probably relying on good-faith and interest in the project to get to the end. Credit due to Laura who managed the whole process and barely complained about it; that’s the mark of a professional. 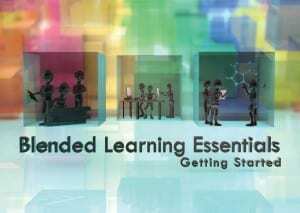 All via UCLeXtend and remain open for study at any time as self-paced courses / open learning resources. This makes me happy. Lastly, it’s surprisingly easy to enable other languages in Moodle – people say negative things about it (shame, but I get it) but being able to just ‘turn on’ Spanish (or whichever) is quite powerful for a globally ambitious researcher who wants to share back to their hosts who gave them so much. And we’ve yet to have a support request in Spanish from a troubled user – I’m worried we’ll only be able to ask them dos cervezas, por favor if they do! But maybe a fair exchange for a password reset? 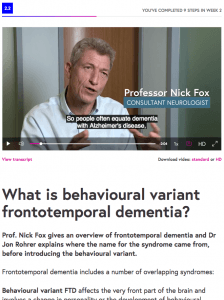 Tim Shakespeare’s course, Many Faces of Dementia, covers rare forms of Dementia. It highlighted how powerful the FutureLearn platform can be at engaging learners. Tim has made a great course, covering Dementia in a human and scientific way. The learners must’ve appreciated this because it trumped many (many) FutureLearn courses in the level of engagement recorded. Courses usually achieve around a 20% fully participating learner statistic but the Dementia course had clocked in over 45%. This means of those who started the course 45% of them went on to completing 50%, or more, of all the steps in the course. If we can get in and see why, we’ll do what we can to share the secret – because this is really good. I won’t go into much detail – it’s not a large sum – but we’re planning on using the income generated for good causes. Originally I hoped to set up a fund for learners on lower incomes to apply for gifted certificates but this is actually quite tricky within university finances. Instead we’re exploring options of funding student research to enhance or report on our Mooc activity. I want to send any income generated in the right direction. Chatty learners & Why We Don’t Post? 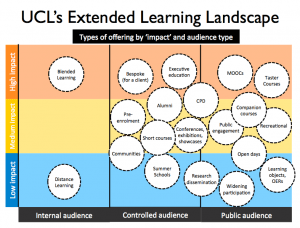 Are shorter Moocs better? I don’t know the minimum or maximum length but 4 weeks, 1-2 hours per week seems good. If it’s actually 4 weeks but 3-4 hours per week, people may struggle to fit it in, and you might lose people. Better research is out there. UCL’s next course, Making Babies in the 21st Century, is six weeks – so I’m still mulling this rule over. Any longer than six weeks and I would be tempted to split the course into two parts, so people can space out the learning and fit it into their lives. Time will tell on this one, ha. The second round of Mooc proposals is open for anyone at UCL to submit an interest in. Initially the call is for expressions of interest in developing a MOOC to run on the FutureLearn platform at some point within the coming 12 months. Briefing meeting at 1-2pm on 27 April in the Logan Hall, UCL Institute of Education. Deadline for expressions of interest is 9 May. Deadline for proposals is 23 May. The panel, chaired by the Pro Director for Teaching, Quality, and Learning Innovation will meet to decide which proposals receive central funding, with notification to teams by 6 June 2016. More information is available via the Teaching and Learning Portal.